NovaBond® IT: A non-etching adhesion promoter that promotes reliable mechanical adhesion for IC-Substrate and high frequency materials. 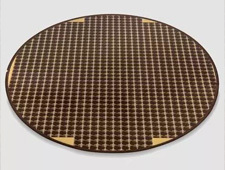 The NovaBond IT process also provides good thermal reliability and is also compatible for solder resist materials. Due to its non-etching nature it shows significant benefits on signal integrity especially in high frequency applications. Multibond®: This Black Oxide process can be operated over a wide range of temperatures and dwell times to produce a variety of bonding properties, depending on the specific applications. BondFilm®: Atotech’s simple and economic oxide alternative process for improved inner layer bonding. 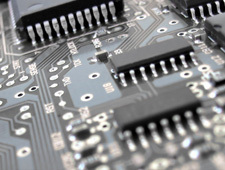 With over 400 lines and installations worldwide Atotech leads this market segment globally and contributes to the success of many key PCB manufacturers. 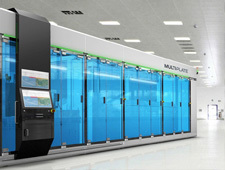 EcoFlash®: Innovative one-step process that was developed for differential etching for SAP and MSAP applications with fine line technology. CupraEtch® DT: Specially developed for Photoresist preatreatment and offers a specifically suited excellent surface roughness for this application. CupraEtch® SR: A very robust process and is suitable for soldermask and photoresist pretreatment. As all CupraEtch processes it has a particularly high copper loading window that allows for minimization of waste water treatment needs and therefore translates directly into cost savings. BondFilm® LDD: The reliable BondFilm® series has been expanded into the BondFilm LDD product in order to create a pretreatment and surface that maximizes CO2 laser absorption and ensure improved direct LDD results. This improved laser absorption property yields consistent hole sizes, reduced “Copper Splash” and less undercut than other LDD pretreatments. ResistAssist 20: Advanced surface pretreatment system specifically targeted at applications with ultra fine feature size and smallest spacing between adjacent features. ResistStrip® Series: The extensive range of ResistStrip® Series products ensures that Atotech has the correct solution on offer for every PCB application need. The product range is based on modified hydroxides and amine solutions to guarantee enhanced stripping performance with minimal corrosive attack. ResistStrip® IC Series: ResistStrip® IC series is an evolution towards suitability for very fine line production and has been specially formulated to meet the demands of the very demanding IC-Substrate industry. The traditional stripping mechanism has been modified to essentially stop the film swelling that leads to lock in and dry film residues in fine line applications and to perform optimal with advanced manufacturing methods such as SAP. PallaStrip® IC 2: A cyanide free palladium stripper that is suitable for use in removal of palladium containing seed layers. The removal of any seeding layer is critical in fine line applications as they can lead to uncontrolled deposition during subsequent plating operations. PallaStrip ® IC 2 offers a simple and easy process solution without the use of any harmful cyanide components, giving the most efficient removal of Palladium catalyst deposits with minimal copper removal. TinSolv® & SolderStrip®: Atotech’s range of two-stage and single-stage metal strippers ensure clean and active copper surfaces after metal resist stripping. 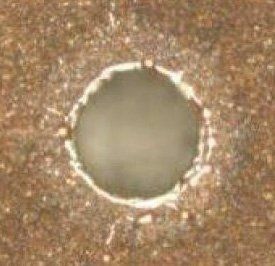 The formulations of TinSolv® (for tin stripping) and SolderStrip® (for tin / lead removal) enable complete and even stripping, both on the surface as well as in small holes and blind vias. 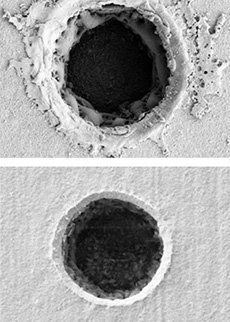 Enabling technology for direct metal deposition on molding resin: Booster® MR is a unique wet-chemical adhesion enhancement process for primer-less metal plating directly on molding resins. Direct plating on molding resin enables applications for conformal electromagnetic interference (EMI) shielding and “direct circuit formation” on molding resins, such as for FO WLP (FO PoP, FO SiP). The Booster® MR process can handle singulated and strip based products, using tape carriers to prevent the I/O side from being attacked by the plating solutions. Adhesion promoter for plating on glass: Atotech’s VitroCoat GI is a new and innovative adhesion promoter that enables wet chemical metal deposition on glass. It can be applied using a short, simple, cost effective dip-coating method. VitroCoat GI’s key advantage is unparalleled coverage in high aspect ratio through-vias versus competing processes such as PVD. The Horizon® BondFilm system offers Atotech’s latest technology package in chemical processing, thin material conveyance and fluid delivery. For high frequency bonding systems we have solutions which offer best possible thermal reliability together with the minimum surface roughening to provide the lowest signal loss for 5G applications. This paper highlights the development of a low etching treatment process which meets all of the challenges of Enhanced functional performance together with lowest signal insertion loss to be suitable for so called 5G applications. EXPT NovaBond EX is a system developed to meet these challenges, with the formation of a smooth copper surface with minimal copper loss (less than 200-nm), which is subsequently treated with a coating of adhesion promotor to provide the strongest possible bond strength. 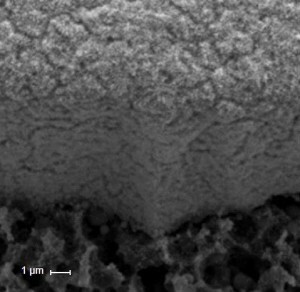 Atotech has developed a new ferric-sulfate based microetching process which is both technically and commercially superior to existing POR pretreatment chemistries for Soldermask and Photoresist pretreatment. The excellent adhesion for ultra-low etch depth together with a high copper loading provide important advantages for the process, because they allow the process to have low bleed within the range of the drag-out, which signicantly reduces waste water volumes. 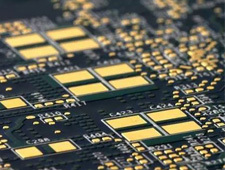 With the trends towards miniaturization and heterogeneous integration, both IC and advanced substrate manufacturers are striving to meet the needs of next generation platforms, to increase the density of interconnects, and generate conductors featuring finer lines and spaces. Advanced manufacturing technologies such as Semi-Additive-Processing (SAP) and Advanced Modified-Semi-Additive-Processing (amSAP) were devised, realized and implemented in order to meet these requirements. 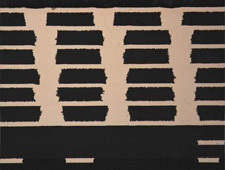 Line and space (L/S) requirements of copper conductors will be below 5/5µm for advanced substrates, with 2/2µm L/S required for chip to chip connections in the near future. 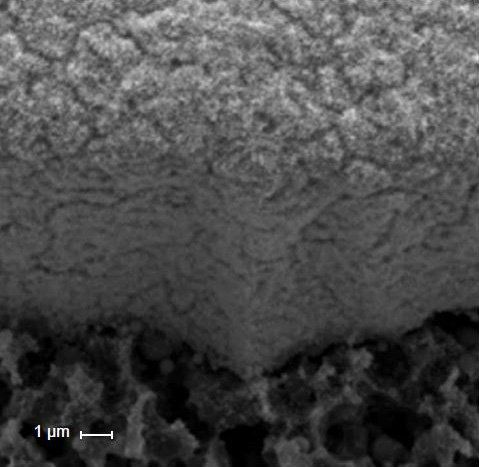 Herein we report about the performance of the new developed ferric sulfate based EcoFlash® process for SAP and amSAP application with the focus on glass as the substrate and VitroCoat® as thin metal oxide adhesion promotion layer. 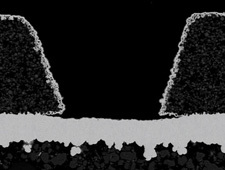 We have successfully integrated the adhesion layer and electroless and electrolytic copper plating technologies into semi-additive process and seed layer etching capable producing L/S below 10 µm.